painful, it is not considered merciful to prescribe an overdose to a cancer victim against her will, or to gently smother a sleeping Alzheimer’s patient. 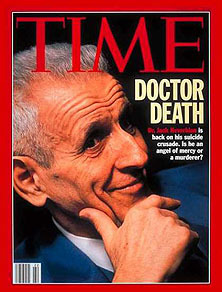 The difference, of course, is that Kevorkian’s clients asked for it. That free choice is what separates assisted suicide from murder, his defenders would insist. What peculiar wording. Douthat makes it sound as if this defense of Kevorkian is some kind of transparently concocted subterfuge. But, yes, the fact that his clients asked for it is what makes assisted suicide different from murder. Even if you don’t approve, this is a pretty natural distinction and an easy one to grasp. So what’s the objection to assisted suicide? This is where it gets weird. Douthat argues that it’s a slippery slope: if terminally ill patients are allowed to kill themselves, what’s to stop anyone else who wants to do it? Nothing, he says, as the example of Dignitas, a Swiss assisted suicide clinic, shows. And technically that’s true: about a fifth of Dignitas’s clients aren’t terminally ill, but merely weary of life. But think about that number: it means that perhaps 200 weary people have used Dignitas’s services over the past decade or so. That’s something like 20 per year. In other words, even after a decade in business, Dignitas almost certainly isn’t doing anything to spur suicides and it hasn’t created a tidal wave of people wanting to die. Like so many other things, it merely provides an additional option for the well off (Dignitas charges about $6,000 to perform an assisted suicide). The less well off simply continue to swallow bottles of aspirin or jump off bridges. So, again: what’s the problem?1 More than anything else, I think this column illustrates the perils of taking a religiously motivated belief and trying to justify it on secular grounds. It just doesn’t work. The slippery slope here pretty obviously doesn’t amount to much, so you’re left with a simple disapproval of people deciding to take their own lives. And what’s the argument for that? Douthat doesn’t provide one. He simply declares it murder and calls it a day. Without recourse to his underlying religious objections, that’s really his only choice. But of course, that’s the real slippery slope. If the state is allowed to prohibit me from killing myself, what else is the state allowed to do? Can it force me to accept medical treatment that will save my life? Can it force me to accept medical treatment that might save my life? If not, why? I’m a liberal, but I’d just as soon keep the state out of decisions like that. I’d especially like to keep the state out if there’s no compelling secular reason for them to get involved. In this case, there sure doesn’t appear to be. 1Needless to say, there are practical issues with assisted suicide. You need to make sure the client really wants to die and isn’t just reacting to a momentary bout of depression. You need to make sure there’s no coercion. You need to make sure the client is of sound mind. But I think all of these things are pretty widely accepted as simple common sense.